I spent some time at Timbernook during the PA day last Friday. Timbernook is the outdoor division of Compass ELC. 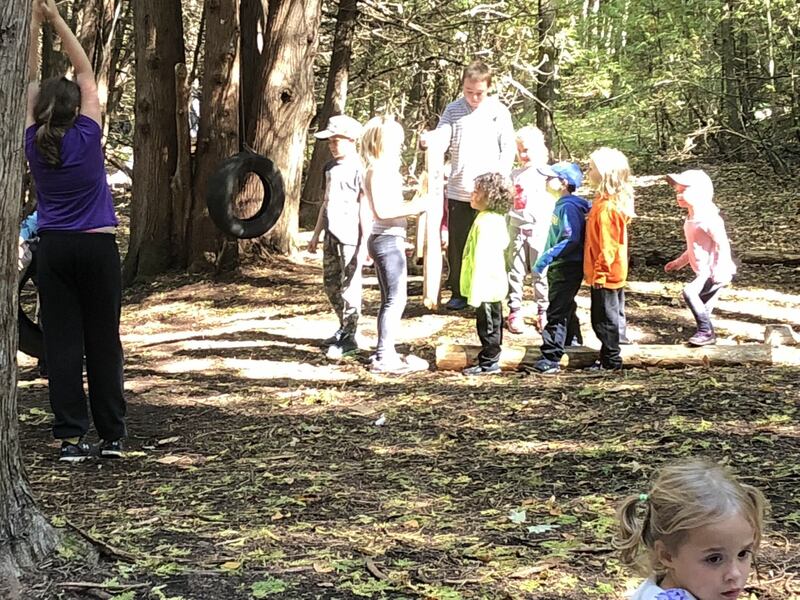 What was really neat to see was children of all ages (4-12) all playing together, helping each other, and supporting the testing of boundaries and risk tolerance. I observed children following each other from place to place throughout the forest, and extending invitations to each other after they had imagined and executed each new plan. They shared their fears with each other, but ultimately pushed themselves, and supported each other to succeed safely. The educators make themselves scarce. They are hiding in the trees in case they are needed, but mostly they stand back and let children be children. The results are incredible! It was fantastic to see the older kids encouraging the younger ones to try their inventions, but ultimately respecting their boundaries when it felt like too much. A few of the oldest kids strung up a tire swing using some pulleys and a rope tied between two trees. After they had tested it sufficiently (for safety and fun! ), they invited the little ones to try it. One little boy stood watching for a while, and was eventually invited to try. He shook his head, and the older boy asked, “Are you sure? It’s really fun! I can help you.” The little boy once again shook his head, and the older boy responded, “Ok. You can just watch,” and then went on to see if anyone else wanted to try. The care with which the older children treated the younger ones was impressive, and I observed that their patient encouragement helped the younger children to feel safe in knowing their boundaries would be honoured, but also safe to try new experiences under the supportive watch of the older children. I was amazed to watch the subtle actions taken by the older children to ensure the safety of the younger ones, such as the addition of a tube on the rope to ensure no one crashed right into a tree at the end of the run, or a helping hand for the younger ones who had trouble reaching the handles, or who felt scared riding alone. 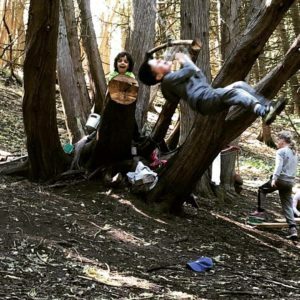 There are so many more benefits that can be seen at Timbernook, but these are a few of the initial reflections I can share after spending a little bit of time in this magical forest north of Lakefield.